The May 6 “March of Millions” on Bolotnaya Ploshchad ended with violent clashes between opposition demonstrators and riot police, who arrested more than 400 protesters. Authorities have finished their investigations into two of the 17 suspects thought to have disturbed the peace at the March of Millions opposition rally on May 6. Maxim Luzyanin has been charged with engaging in violence “not dangerous for life or health in relation to government officials” and with participating in a riot, the Investigative Committee said in a statement Monday. Luzyanin is accused of throwing asphalt at a police officer and, with accomplices, tearing off a riot policeman’s uniform, knocking him onto the ground and beating him. 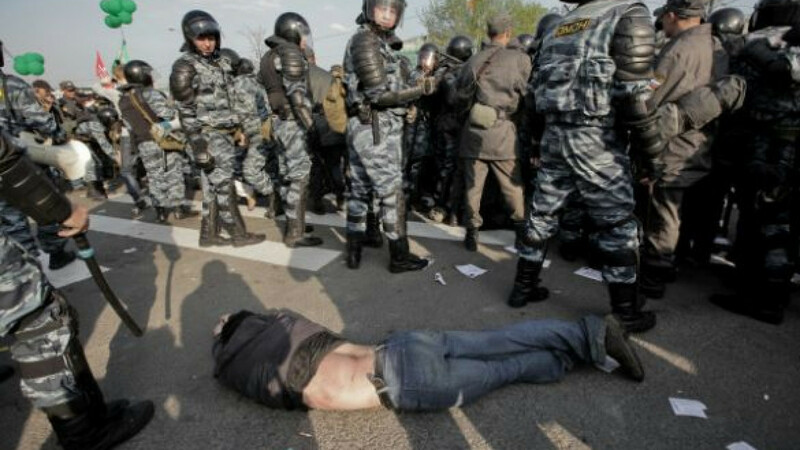 The riot policeman suffered “cranio-cerebral trauma” and other injuries, the statement said, adding that Luzyanin also attacked three other police officers and tried to strangle one of them. Luzyanin’s lawyer, Sergei Shushpanov, told The Moscow Times that his client had admitted his guilt. Luzyanin faces up to five years in prison for the violence-against-authorities charge and up to eight years for participating in a riot. Investigators determined that another suspect, Mikhail Kosenko, was mentally unstable and did not understand the danger his undisclosed actions posed. They recommended that he undergo psychiatric treatment and asked prosecutors to confirm the decision. The investigations into the 15 other suspects were nearing completion Monday, the committee said. The May 6 rally on downtown Moscow’s Bolotnaya Ploshchad ended with violent clashes between opposition demonstrators and riot police. More than 400 people were detained. Twelve suspects were still in detention as of Monday. Four others were under court-imposed travel restrictions, and one suspect was under house arrest.